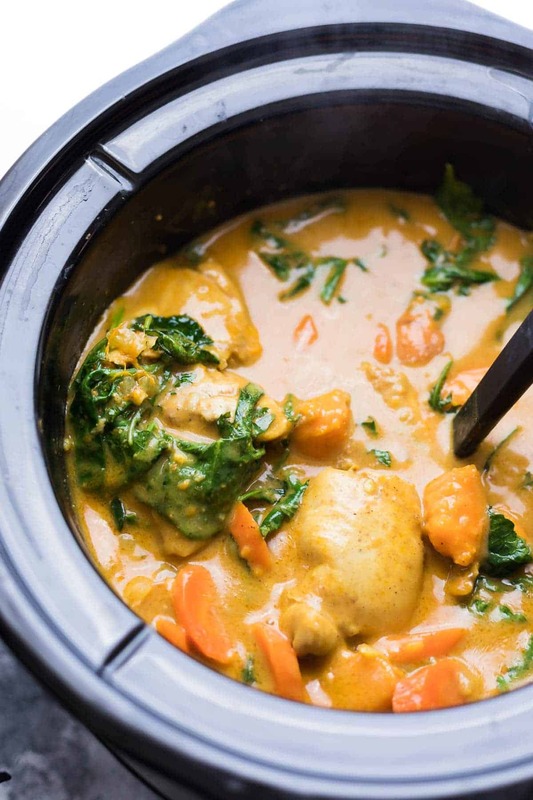 Slow Cooker Sweet Potato Chicken Curry can be assembled ahead and stashed in the freezer for an easy, flavor-packed dinner. When you’re ready to serve, thaw and dump in the slow cooker and you’re ready to go! That feeling you get at the end of the day when you finally get to crawl in bed…the whole world stops, your bed seems to ‘hug’ you, and you let out a big ‘aaaaaah’. Best feeling of the whole day! The way you can go from perfectly fine to a hangry crazy person who NEEDS. FOOD. NOW!!! I learned I can never leave the house without a granola bar. Those cravings. They become like an obsession where you need to have nachos/fettuccine alfredo/pizza/insert-unhealthy-carb-of-choice-here, and you won’t be able to rest until you have them. And when you finally get your craving, it tastes like the BEST thing you’ve ever eaten (even if it’s from the freezer aisle of the grocery store). My cravings have been so unhealthy, but now I’m emerging from the morning sickness/survival stage, I’m happily craving and eating much healthier food that’s better for me and the baby. 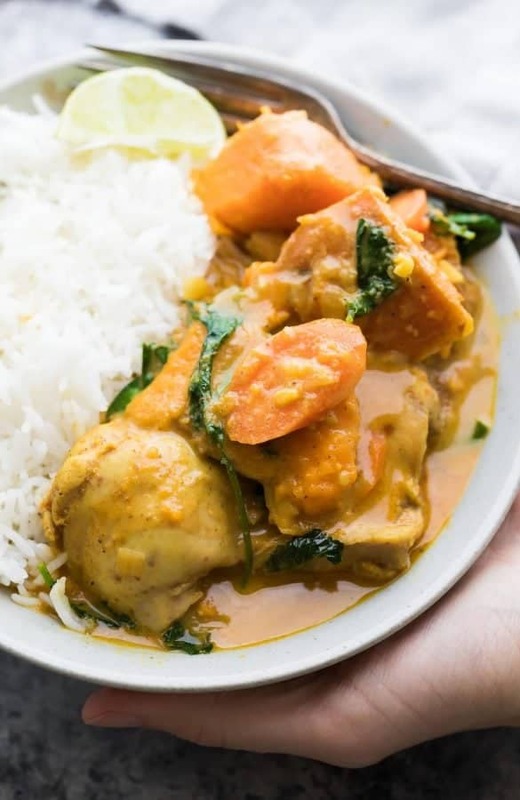 This slow cooker sweet potato chicken curry was one of my cravings, and I happily ate every bite right up. I’ve been working hard to come up with some meal prep dinner recipes, and this is my second freezer to crock pot recipe. Check out this Healthy Slow Cooker White Chicken Chili (Freezer to Crock Pot)! , but I was looking for a recipe that doesn’t include lemongrass, galangal root, or kaffir lime leaves, because I want my recipes to be made with ingredients accessible to everyone. So I experimented and after 3-4 batches, ended up with this delicious and SUPER flavorful curry, made with stuff you should easily be able to find in your store. Here’s my warning to you. 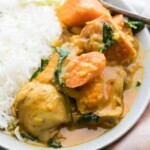 WARNING: this slow cooker sweet potato chicken curry is on the sweet side! (It’s not JUST sweet, it has all those beautiful contrasting curry flavors: savory, spicy, sour, and all those delicious spices). Personally, I love a sweeter curry. But if that’s not your preference, this is not the recipe for you. As the sweet potato cooks, it breaks down a bit, thickening the sauce and sweetening it too. Some suggestions to reduce the sweetness: swap some or all of the sweet potatoes with red potatoes. Or omit the brown sugar. So. The thing about this curry is that you do need to make a ‘flavor base’ before freezing or throwing in the slow cooker. I love recipes that you can dump straight into the slow cooker without pre-cooking, but unfortunately that just doesn’t give the same flavor for this recipe. 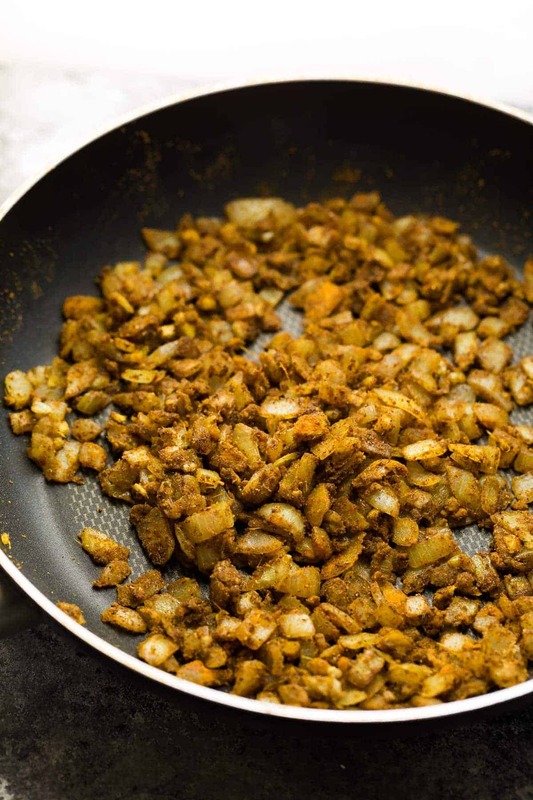 The flavor base= onions + garlic, ginger, and allllll of the spices in this recipe, sauteed together to make the most deeeelicious base to your recipe. It takes a total of 10 minutes, so it’s not really too much effort, and you will be rewarded with some serious flavor! And the best part: it’s freezer-friendly! 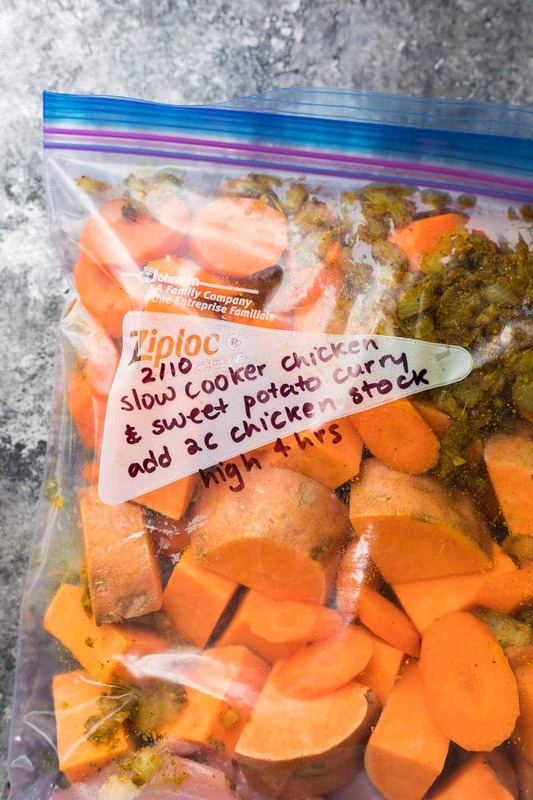 You can assemble all of your ingredients (minus the chicken stock), and freeze them for up to 3 months before thawing and dumping in the slow cooker. I was worried about freezing the raw sweet potatoes, and they browned a tiny bit, but after 4 hours in the slow cooker, I wouldn’t have guessed in a million years that the whole thing had been frozen. make it vegetarian! Omit the chicken thighs, and use one or two 19 oz cans of chickpeas (add after curry has cooked through). 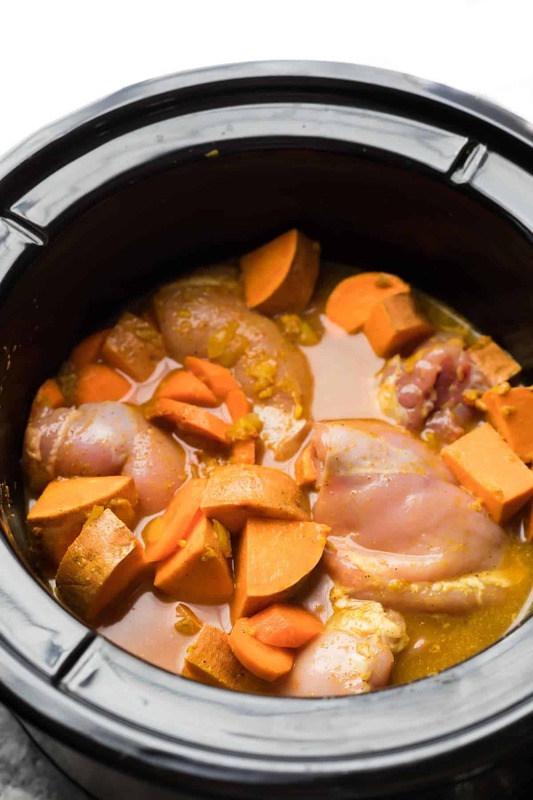 Slow Cooker Sweet Potato Chicken Curry can be assembled ahead and stashed in the freezer for an easy, flavor-packed dinner. When you're ready to serve, thaw and dump in the slow cooker and you're ready to go! Heat oil over medium heat in a medium pan. Add onions and brown sugar and sautee until onions are cooked through, around 5 minutes. Add the garlic and ginger, and cook for 2 minutes, until fragrant and soft. Add the curry paste, peanut butter, garam masala, cumin, turmeric and salt. Stir to coat onions and toast spices for 2 or so minutes. To cook right away:Transfer the onions to the base of a 5 quart slow cooker along with the chicken, sweet potatoes, carrots, fish sauce and chicken stock. Cover and cook on high for 4 hours or low for 6 hours, until sweet potatoes are cooked through. Stir in the spinach/kale, lime juice and coconut milk, cover and cook for 5 minutes. 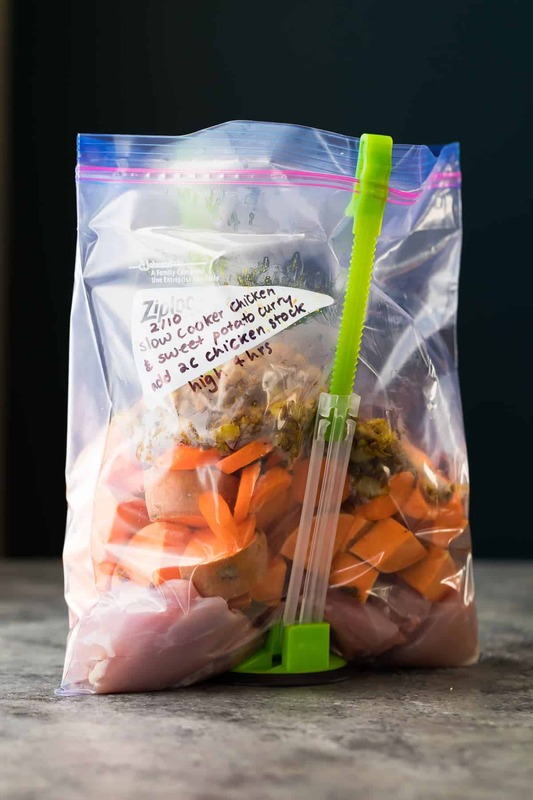 To assemble ahead:In an 8-cup storage container or a quart-sized heavy duty freezer bag, add the chicken, sweet potatoes and onion/spice mixture. Seal and freeze for up to 3 months. Thaw completely before cooking. Add thawed mixture to the slow cooker and stir in 2 cups of chicken stock and 2 tablespoons fish sauce. This curry is medium-spicy (this will depend on your curry paste). The sweet potatoes are fall-apart tender and dissolve a bit into the sauce. this recipe looks great and plan to try it out for tonight! . . this may sound like a silly question but I have a Kaffir lime tree and am excited to use the leaves in something . Do you think the kaffir leaves could be substituted for the lime juice? if so how much ? Hi Sara! I am so jealous of your lime tree! Lime leaves are awesome in curries. I would do 2-3 leaves and have a taste after it’s done cooking. If it seems like it’s missing something, you could try adding some fresh lime juice as well. Hope you enjoy! Will this recipe work with Beef? Hi Cherie! I haven’t tried it but I don’t see why it wouldn’t work. If you are using cubed beef the cook time should be similar to chicken thighs. Let me know if you try it! As much as I try, I really don’t love chicken thighs. Would breasts dry out in this? I don’t cook in crock pot often but trying to start for meal prep – is there a recommended cook time if I switched to breasts? Thanks! Hi Tara! You could definitely use chicken breasts in this. I find bone-in chicken breasts stay the most moist in slow cooker recipes, but if you do use boneless skinless, I would cook on low for 4-6 hours. Hope you enjoy! I love the bone-in chicken breast idea but how many chicken breasts would I need for this recipe?? Hi Shenelle, I would go for about 1 1/2 lbs. I rarely cook with bone-in chicken breasts, so I can’t say how many this would be…maybe 3? Make sure they have the skin off or your curry will end up very greasy. This recipe was absolutely wonderful. Definitely the best thing I ate in 2018 thus far. I skipped the sugar like the above commenter and it was so delicious. Thank you! Made this tonight and it was delicious!! I left out the brown sugar based on your recommendation and I thought it turned out great! Thanks so much for sharing such a wonderful recipe. Hi Lynda! So glad you enjoyed it. I have a batch in my freezer and can’t wait to dig in. Hi! When freezing, I imagine you still cook up the onion spice mix before putting it in the freezer bag? Thanks! Can I leave the fish sauce out the freezer to crock pot chicken curry? Don’t like the taste or smell fish sauce gives any dish and it puts me off. Hi Brenda! I’ve only tried it as written. If you leave out the fish sauce, taste it before serving…if you think it needs a little more ‘savory/salty/umami’ flavor, try adding some soy sauce. I think it will still be tasty without. Let me know if you try it! This looks delicious! I love that it’s freezer to crock pot! So quick and easy for busy weeknights!